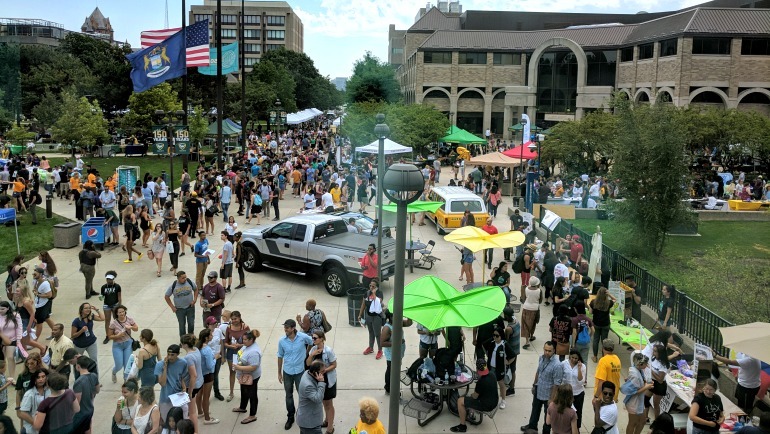 Wayne State University’s Midtown campus is busier than ever this fall as the university welcomes the largest group of full-time freshmen in its 150-year history. When classes began Aug. 29, there were 2,955 full-time freshmen — an increase of 15 percent over last year’s incoming freshman class. While finalized enrollment numbers won’t be available until mid-September, indicators show that this year’s freshman class is diverse and academically strong. The incoming class also includes the university’s largest FTIAC group – composed of full- and part-time students entering their first year at any college or university – in a decade. Excitement around campus and Detroit have never been greater and the university — which unveiled the new Anthony Wayne Drive Apartments this semester — boasts full capacity for on-campus housing. The new Mike Ilitch School of Business is now open, and ground will be broken for the Hilberry Gateway Performance Complex this fall. Medley also cited a recently restructured financial aid award process as a contributing factor for the increase. The university has increased its commitment to low-income and first-generation students through a robust suite of awards and programs, including a first-generation fee waiver and the Wayne ACCESS Award, which covers the full cost of all tuition and fees. More than one third of the incoming freshman class are recipients of the Wayne ACCESS Award and will pay zero out-of-pocket costs. Additionally, the financial aid award process now takes a holistic approach to evaluating merit-based scholarships, rather than the traditional focus on standardized test scores. For example, WSU recently partnered with Raise.me, a program that allows high school students as early as ninth grade to earn micro-scholarships for various achievements, including GPA and test accomplishments, volunteering, holding a leadership position in a school organization, or participating in an extracurricular activity or sport.